You’ve found it! 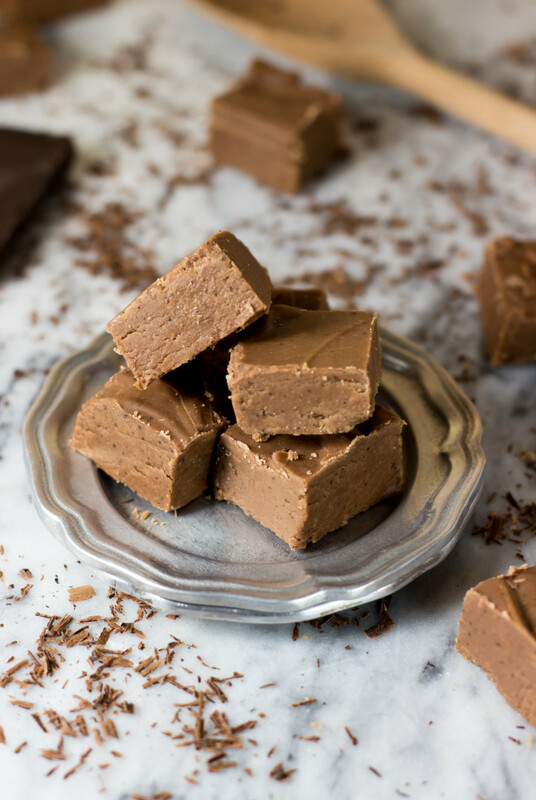 The best chocolate fudge recipe — a classic, old-fashioned, chocolate fudge recipe made with simple ingredients you probably already have in your pantry (no condensed milk here). More accurately, I thrive on traditions that revolve around food. Christmas Eve just wouldn’t be the same without my grandmother’s home cooked dinner (roasted chicken, mashed potatoes, buttered broccoli, the works). Birthdays require cake (last year Zach tried to tell me he didn’t need a cake, not realizing this was non-negotiable), and every Easter my siblings and I make homemade Easter candy together. And, every Valentine’s Day, my mom makes a big batch of old-fashioned chocolate fudge for us to enjoy. 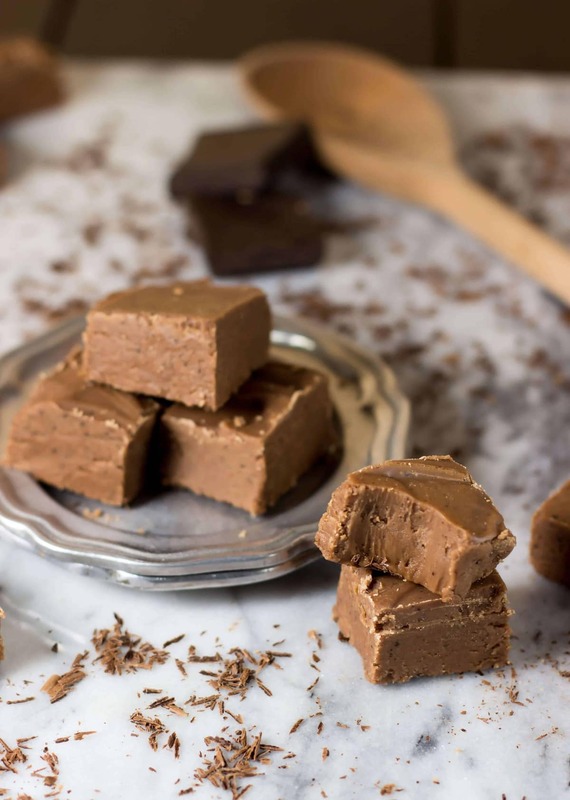 Not just any fudge — the best chocolate fudge — creamy, rich, soft and chocolaty, made with plain and simple everyday ingredients: sugar, milk, corn syrup (not to be confused with high fructose corn syrup, these are not the same thing), chocolate, butter and vanilla. No condensed milk, no evaporated milk, and no marshmallow fluff is used here, only basic ingredients you probably already have in your pantry. 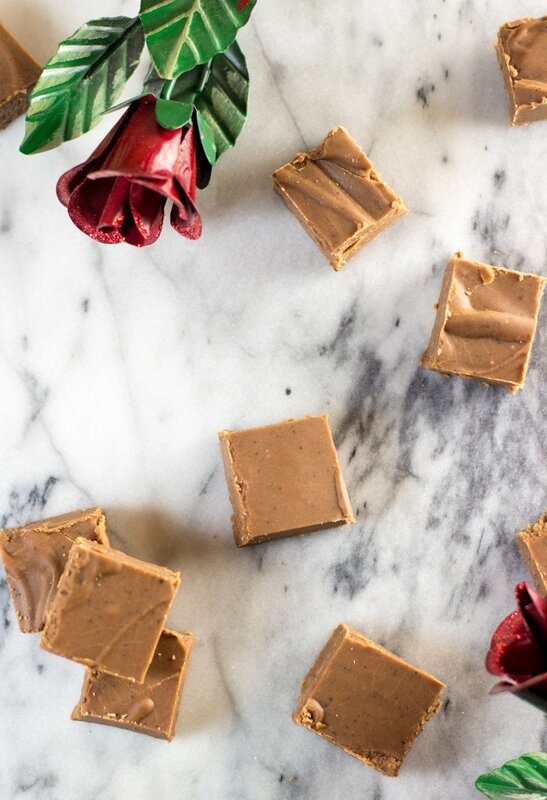 I can’t remember exactly when my mom first started making it, but fudge can be tricky and a bit time-consuming and so she made it a once-a-year thing, a Valentine’s Day tradition. On this highly anticipated day, she carefully measures and manipulates the ingredients, bringing them to a boil and checking her thermometer for “soft ball” stage. Finally, after a lengthy cooling period, my siblings and I were allowed to analyze the results. When she first started making fudge, sometimes it would come out a bit grainy on her first attempt (especially since, trying to satiate the chocolate greed of 6 children, she would double the batch, which I do not recommend you try when making candy), but that never stopped my siblings or myself from devouring each and every last delectable chocolate crumb. At this point, though, she definitely has this recipe down, and I wanted to share it here, with you. I called her numerous times throughout the process to make sure I had all of her tricks and tips so please make sure to carefully read them before beginning. If you follow the instructions carefully, you shouldn’t have any problem (but don’t be discouraged if things don’t come out perfectly the first time; candy making is a skill that may take more than one attempt!). Don’t crank your heat up too high when bringing your mixture to a boil. Medium-high does not mean high-high to speed up the boiling process. Fudge takes patience. 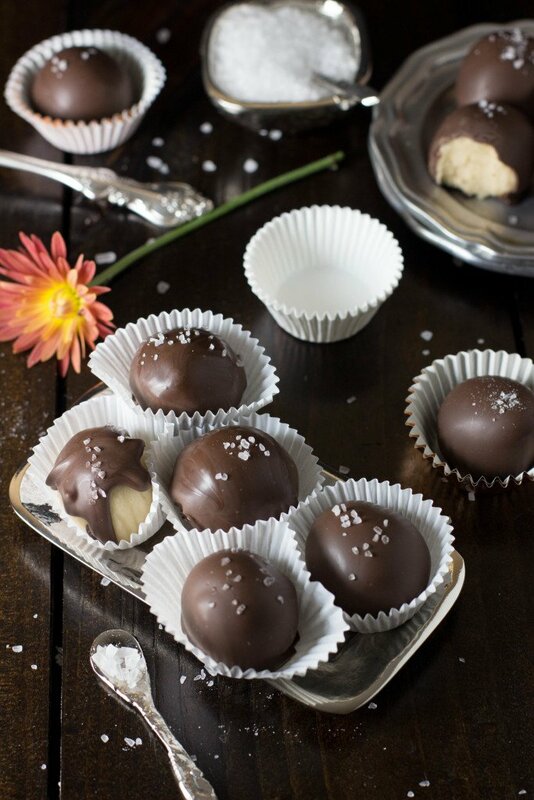 Break your chocolate into pieces (they don’t have to be too small or chopped, but don’t just toss a whole block in there) and allow it time to melt while the mixture comes to a boil. Don’t stop stirring (with a wooden spoon) this whole time. Don’t scrape the sides of the bowl above the mixture line. Chocolate, sugar, and milk will spatter the sides. Use a damp pastry brush to clear this off of the sides of the pot because the granules from the sugar can make your fudge too grainy if they fall back into the mixture. I recommend using room temperature butter when you add it to the fudge mixture. Perhaps it would be fine to use cold, but I do not want to do anything to “shock” the fudge and make it drop its temperature too rapidly, so I use room temperature butter and have gotten better results with this. Once you add your butter and vanilla DO NOT UNDER ANY CIRCUMSTANCES stir your mixture, you want to disturb it as little as possible. The butter will melt as it cools, and you will stir it in later. Please, leave it alone until the temperature dips just below 110F, not a degree before then. Once you finally dip below 110F, stir, stir, stir… but don’t stir too much. I know, this is vague, and it may take you more than one try to get a knack for this. For perfect fudge, you want to stir until the mixture begins to lose its glossy sheen and is thick, this can take a few minutes. 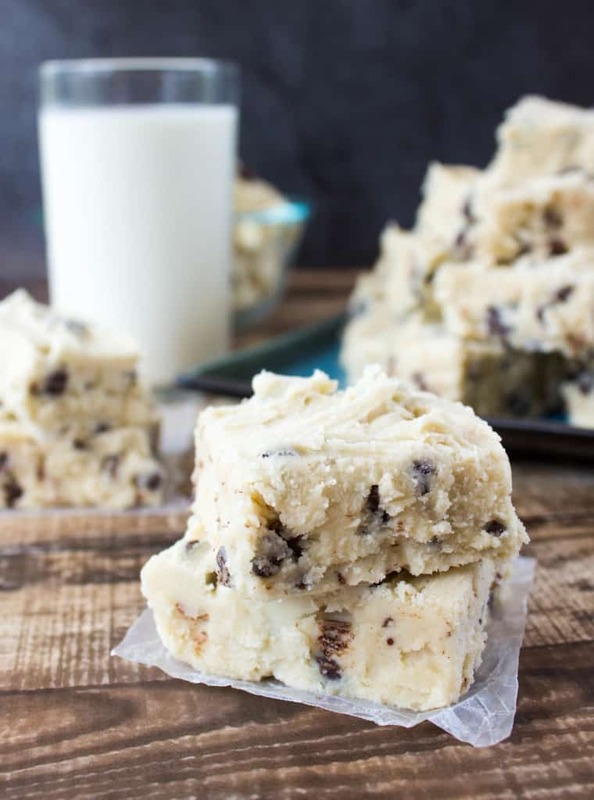 Stirring fudge can be a workout, keep going without stopping, and it’s not a bad idea to have someone else nearby ready to help you with the stirring if you’ve been skipping arm-day at the gym. When stirring your fudge for the final time and pouring it into your prepared pan, don’t scrape the sides of the bowl above the mixture line — again, you want to keep those granules out of the fudge. There you have it. 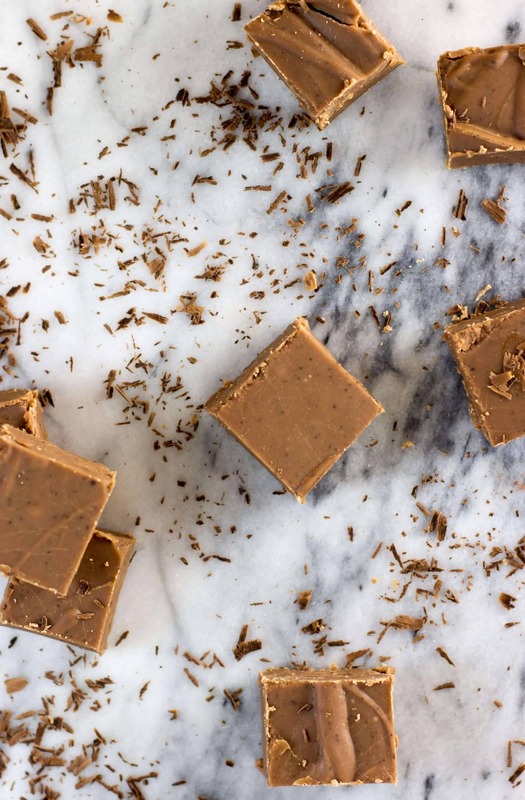 A perfect fudge recipe and some tips to make sure it comes out perfectly. If you have any questions or need some help trouble-shooting, please feel free to drop your questions in the comments section and I’ll see if I can help. Maybe it’s time for you to incorporate this recipe into your own food traditions. Generously butter an 8x8 baking dish and set aside. Lightly dampen a pastry brush and keep nearby the stove. In medium-sized saucepan combine sugar, milk, corn syrup and chocolate over medium heat. Using a wooden spoon, stir constantly, occasionally brushing the side of the pot with the pastry brush to remove crystals that might fall into your fudge. Once mixture begins to boil, attach your candy thermometer to the pot (make sure the bottom of the thermometer isn't touching the bottom of the pan). Stir mixture occasionally until your thermometer reads 238F (soft ball stage). Leave mixture undisturbed until your candy thermometer reads 110F. Immediately once the fudge begins to thicken pour into prepared 8x8 pan. 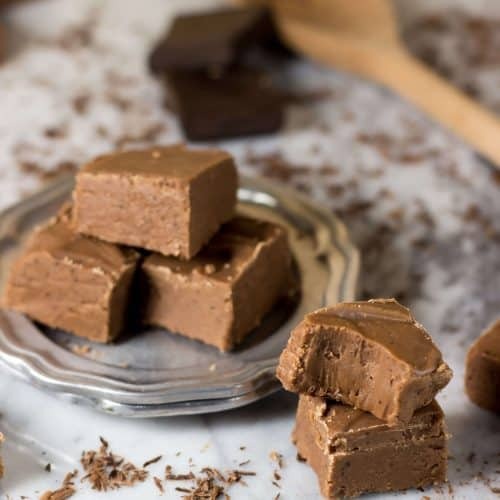 This recipe is the ultimate fudge recipe!!!! It is reminiscent of how my Grandpap made it. This is the first and only recipe that I have used that is what I was looking for. It LITERALLY melts in your mouth. And I thought it was quite an easy to follow and not time consuming; though I’m a mother of three so I was quite busy while waiting!! It’s a dangerously perfect and delicious recipe. Thank you for sharing. Cool to 110F before stirring? I made this fudge last night. It was time consuming, but I followed the directions exactly. The only changes I made were in using unsweetened baking cocoa powder versus the squares (converting 3 Tbs. Cocoa plus 1 tsp butter for each one ounce square) and I didn’t have a candy thermometer, so I inserted the meat thermometer frequently while trying to reach the higher temp and infrequently while cooking it off. The fudge is refusing creamy. I’m shocked at how is as though it melts in my mouth. It is very sweet, but addictively so. And I couldn’t get it past a sticky syrupy texture while stirring it in the end. So I asked for my teenaged sun to store for a few minutes. I guess he was better at it because within 30 seconds it had turned into a hard fudge, within the pan. So I dug it out and broke it in chunks. As awful as it looks, it tastes truly amazing. Thank you for this recipe. I’ll continue trying to make it, hoping to get it right. 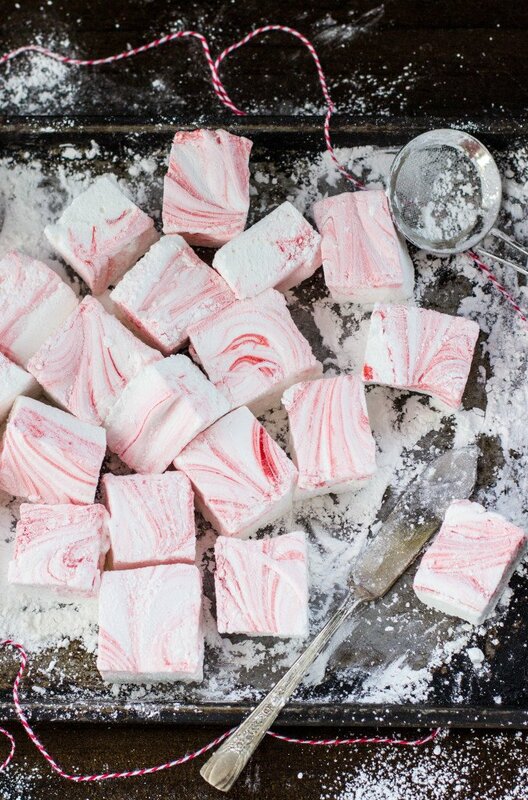 Absolutely perfect fudge! I’ve been making this all through the holidays this year and we can’t get enough!